You've decided to go to Disney. If you're lucky, you've decided well over six months in advance. Maybe you've even booked your hotel, gotten tickets, and if it's the right time of year, you got a package with free Disney Dining! The most popular restaurants and rides need to be booked in advance. It's a pain to remember and annoying to have to have a "schedule" on your vacation (I know some people like a schedule but stick with me...). What's so annoying is dining reservations open 180 days in advance. That's really early to make decisions about what you'll eat and where you'll be. If you're staying at a Disney resort, you can book rides and shows (FastPass+) 60 days before your arrival day. People staying elsewhere but with tickets can get FastPass+ 30 days in advance. [note: there are different rules for Annual Pass holders but I assume if you've purchased an AP, you know enough to figure out your own "details"). Many, if not most, guests know these dates so if you don't book early, the most popular choices and times won't be available. 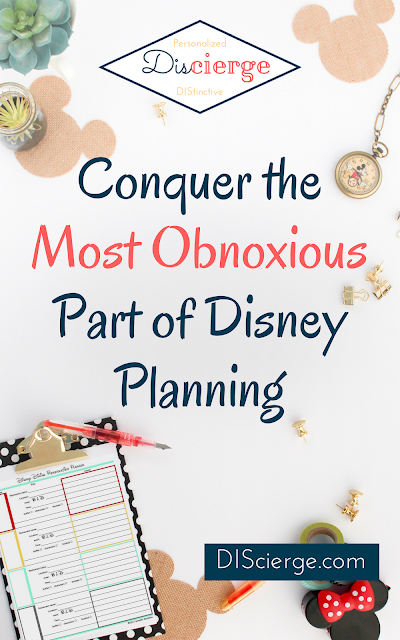 Forgetting to book dining and FastPass+ will NOT ruin your vacation---unless you let it. Being prepared, even if that's knowing what you're missing, is the best way to deal with the annoyance of booking restaurants six months in advance. You can get my free, customizable planning and countdown calendar to help you. If it's more than 180 days in advance, you should at least put a little thought into dining and FastPass+ selection, even if you decide to skip both. You can skip ahead to, "I've Got More Than 6 Months," if that applies to you. What do you need to do immediately? If you think you're close to 180 days, determine if your trip starts in six months or less. If it's close and you're not sure if it's exactly 180 days or not, head over to My Disney Experience and see if you can book a dining reservation during your stay (it doesn't matter what restaurant, you're just seeing if your vacation dates are available, indicating if it's 180 days, don't actually book anything). If you've still got time, skip to the section for "I've Got More Than 6 Months," otherwise, keep reading. If dining reservations are already open for your vacation, you need to consider if you want dining reservations. If you want character dining (that includes Mickey, Minnie, princesses, etc.) you need a reservation. Those are definitely some of the hardest to get so finish this section and then stop reading and figure out what is available and/or what you want. If you are on the Quick Service Dining Plan, that doesn't include character dining (you can always just pay out of pocket if you want to do character dining, in that situation). Currently, Be Our Guest (Magic Kingdom)---for breakfast and lunch, only---can be booked and accepts the Quick Service Dining Plan. In My Disney Experience, you can filter by accepted dining plans to get the most up to date information. Other Quick Service locations don't accept reservations (so if you're only doing Quick Service, no need to make dining reservations except if you want to do breakfast or lunch at Be Our Guest). Note you can also filter for quick service that accepts reservations if you want to verify what I've said is still true. Things change at Disney---this info is current in early 2017. I'm guessing if you didn't know about making dining reservations, you don't have a list of restaurants you want to eat at so I'm not going into a lot of details. If that is true, make reservations if you like having a schedule or have other considerations (including things like picky eaters---note that Disney is one of the best places for dealing with allergies and special diets so you may not need to search for restaurants to address those issues---your call). If you don't get a reservation you want, check back later. Some locations and times are hard to get but people sometimes have to change their plans. Check occasionally to see if you can get what you want, including the day of, several hours in advance. If you don't like following a schedule, I advise avoiding dining reservations unless you just really want a particular restaurant. There will be some table service reservations still available (I noticed for day of reservations, many came open for about 9 p.m. if you checked about 4 p.m.). If you want to be foot-loose and fancy-free as far as not being tied to a schedule, but do want to sit down and be served (I understand!) consider eating early or late. Just like in the "real world," the wait will be shorter. If you're skipping table service, and aren't on the Quick Service Dining Plan, you can consider snacking for meals. I'd rather eat snacks at Animal Kingdom or Epcot than many of the meals (especially at Animal Kingdom). You may be able to convert three snacks to a Quick Service meal (for dining plan) but we got really mixed responses about this on our recent trip, so don't rely on it being an option. Your dining plan credits aren't assigned to a person so you can be flexible with who "eats" which credits. We almost always share a meal and just eat multiple times (even when not on a dining plan). If you have a family/group where everyone can stand in a line on their own (i.e. kids don't need to be supervised) there's no reason you have to all eat at the same place. If the Food & Wine Festival or Garden Festival are going on at Epcot, the booths are the place to eat. My foodie sister even raved about some of these (and that was the Garden Festival, not Food & Wine Festival!). Check out the Disney Food Blog for lots of up to date information about both these festivals. Do you get the idea it's OK if you've got less than 180 days? We've booked two trips that way, one less than 60 days and one less than 30. We had a great time, both times! That's enough about dining, for now. If it's less than 180 days but more than 60, go figure out your dining options then come back to learn about attractions. If it's 60 or less, keep reading. What about FastPass+, do you need it? I suggest taking a look at your options. Like dining, if there's something you REALLY want to ride or see, and waiting for an hour is an issue, you want a FastPass+. You can only book three FastPass+ per day, in one park, in advance. The day of, you can keep getting FastPass+ as you use one (so never more than three at a time plus you can get them in different parks on the day). Naturally, that means it's harder to get FP+ later in the day. This has a lot to do with how crowded the parks are. Some rides and shows don't even offer FP+ (these are less popular but will still have some wait most times of year---at peak season, it's a relatively long wait, completely off season, you may be able to walk up). I think you might as well book FP+ if you think you'll use them. However, please be kind and cancel them if you know you won't use them. This can make them available for another guest. Wouldn't you like to be able to get a last minute FP+ to a popular ride? That only happens if one is canceled. There's a better chance you have particular rides you want to ride if this is a long awaited trip. Use My Disney Experience to learn about your top ride picks and see if a FP+ is an option or available if you're in your booking window (note that characters are listed separately from "attractions" but relatively few characters have a FP+ option, only the most popular). You can sign-up to get my countdown and planning "calendar" for free, below. This helps you figure out the 180, 60, and 30 days before your arrival without doing the math. It also gives you a place to note other items you might want to do at certain milestones before your trip. Write the actual dates in by starting with your arrival day and working backward. You'll notice when you get to the "first" page, I didn't list days, I listed weeks. If it's not quite to six months and you want to figure out when 180 days is, grab my calendar printable. It is designed for you to enter your arrival date on page three and then work back to 30, 60, and finally 180 days. You can write in any other vacation related tasks you need to do at "milestones" (because you know you want to do things at 1 week before or 6 weeks before, and need to determine the date). If you don't know anything about Disney dining options or what a FastPass is, you can either read the section above (ignoring the suggestions related to being short on time) or use the links at the end of this section. You've got more time to read and learn so I'm not going to try and condense all that information here when others have done a better job covering each topic in detail. I've covered the absolute basics in the above sections. What I do want to say is, if you don't have specific dining desires, don't make dining reservations unless you like being on a schedule. There will be restaurants with availability if you want a sit down ("table service") meal. If you are just planning to eat fast food ("quick service") you can only reserve Be Our Guest in Magic Kingdom for breakfast or lunch (dinner is table service). All other quick service is like any other fast food place, no reservations. So for those of you familiar with dining reservations and FastPass+, what else would you put on the calendar? You could note vacation basics like scheduling to have your mail held. I like to do crafts (on our daughter's first trip I made the two of us a bunch of clothes). You might want to mark milestones with something fun (a special copycat meal, maybe). I like keeping the magic going between vacations so even if it's 20 weeks out, I like to do something "Disney." Seeing a calendar with the milestones helps me plan better so I don't end up making eight outfits three weeks before we're leaving! Here's an example. For our upcoming trip, I have to get a monorail outfit for our youngest and I need to "resize" my daughter's monorail outfit (yeah, you heard me, "monorail outfit"). I also found this great tutorial for a small Disney "purse." I'm loving it because I've never liked having a lanyard for my pins. It pulls on my neck too much. Now that we've got MagicBands, I don't need the card holder on a lanyard for my Key to the World Card, and PhotoPass card, and... I'm seriously looking forward to this craft and want to make sure I get it done (I suspect my daughter will also want one once she sees mine). Learn more about Disney Dining here (official) and here. Learn about FastPass+ here (official) and here.